There are a lot of mounts in SWTOR. For a while I used the Longspur STAP which I got through the Collectors Edition. Or was it just for pre-ordering... I don't remember. Then I switched to the Custom-Built Hoverbike which my CyberTech Jedi Knight built. They were nice and all, but they were not the classic Star Wars mount. That would be the Speeder. I had not come across one of those yet, so when the Chevin Scavenger Hunt came along I was very happy to see a speeder bike, the Hyrotii Scrapper, was one of the rewards. Sure, it's a bit beat up. It's also rather slow, as it only provides a 90% speed bonus. That speed has gotten me killed in world PvP. Unlike newer mounts, this one does not scale to your piloting rank. I just love the look of this mount. The smoke trail, the electrical shorts, it just suits me. It would be perfect if BioWare made it adaptive like the other speeders. Another thing it has going for it is that no one else uses it. 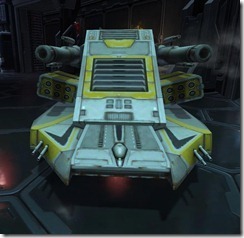 There is a mount I would ditch the Scrapper for, the Avalanche Heavy Tank tank mount you can get from the Explosive Conflict Operation. I have zero chance of getting it, but it looks very awesome, and it's a tank! Come to think of it, I might buy something like that if they ever offer it.